The Diamabrush™ Hand Tools removes mastics, glue, adhesives, epoxies, thin-set, paint, and many other gummy coatings up to 10 times faster than competitors products. Diamabrush hand tools avoid the use of messy and dangerous chemicals. The easy to use design removes previous coatings and profiles the concrete in one easy step and with no kiss or ridge marks! The DiamabrushTM hand tools are perfect for professionals and DIYers. The hand tools provide fast, effective surface preparation and coating removal. Perfect for those hard to reach areas. Can be used by itself for small garages or in conjunction with a floor grinder for larger projects. The patented design enables users to easily remove coatings without loading up or clogging the abrasive. The result is a perfectly profiled surface achieved in less than half the time of competitive abrasive tools – saving cost and time for the end-user. 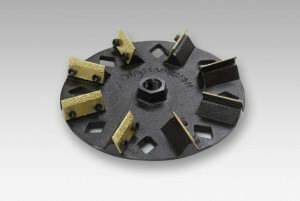 4.5” Diamabrush Removal Tool is perfect for removing old coatings from concrete and preparing your floor in one step. These feature the same blades as our larger machine mounted tools in a size designed for a hand held angle grinder. 7” Diamabrush Removal Tool is perfect for removing old coatings from concrete and preparing your floor in one step. These feature the same blades as our larger machine mounted tools in a size designed for a hand held angle grinder.